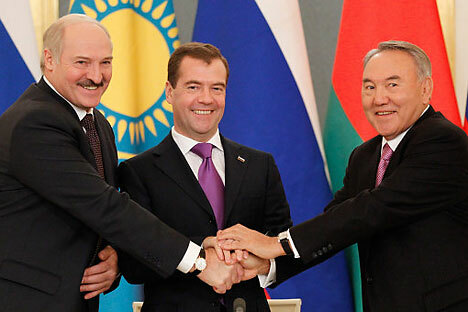 In 2010 three members of the Eurasian Economic Community -- Russia, Belarus and Kazakhstan – set up a Сustoms Union eliminating duties and most other restrictions in mutual trade. Since January 1, 2012 this group of states has created a common economic space – a single market with free movement of goods, services, capital, labor and a coordinated economic policy. In order to expand integration in March 2012 a treaty on the Eurasian Economic Union was to be signed. Why did not it take place? What is the way out of this situation? The agreements on ultimate elimination of the Eurasian Economic Community structures and their transformation into the structures of the Eurasian Economic Union were reached at the summit of the leaders of EurAsEC member states on December 19, 2011. At present the Eurasian Economic Commission chaired by Viktor Khristenko has already started its work. The Commission is to take over the functions of the liquidated structures of the Customs Union. The formation of the Eurasian Economic Union was aimed at elevating the status of this Commission. The Court is also being created as well as other governing structures of the Eurasian Economic Union. All these issues were discussed at the last EurAsEC summit on March 19, 2012 in Moscow. However, an agreement on the results of the summit was not signed. Initially the media reported that the main obstacle to signing the agreement was the position of Belarus. Moscow was in favor of vesting the supreme council of a new alliance consisting of presidents of the three countries with the right to take final decisions. There was also the proposal to give the Eurasian Economic Commission the right to conclude international contracts on behalf of the three countries. Belarus insisted on the right to veto any future decisions of the alliance at a state level. Moscow suggested naming the new organization the Eurasian Economic Union (EAEC), Belarusians - the Eurasian Common Economic Space (EAEEP).However, after the failure to sign the agreement the head of the Republic of Belarus Alexander Lukashenka launched a “public relations” attack in the Russian media claiming that the reason for not signing was not his position but the position of Kazakhstan. In particular, he said that in principle he agreed that the Eurasian Economic Commission should be given the right to conclude international agreements. The official position of Kazakhstan on the treaty was clarified at a press conference of E. Bulegenov, Ambassador of Kazakhstan in the Republic of Belarus, at the end of March 2012. He said in particular that in the opinion of his country the transformation of EurAsEC into the Eurasian Economic Union should not be accelerated; it is necessary to get adapted to the conditions of the Single Economic Space first. There are a lot of difficult problems on the way to signing the treaty, affecting primarily economic relations between Russia and Belarus. And it is not without reason that most experts call the position of Minsk a major obstacle to an agreement. The economy of Belarus is markedly different from those of Russia and Kazakhstan. In fact, the country continues to live in socialism, with the economy being dominated by public sector. In contrast to Moscow and Astana, Minsk’s accession to WTO is a long way off. Spurring integration would make the country's leadership automatically speed up market reforms, which could lead to changes in the political system as well. Belarus would become more and more indebted to Russia. It could only pay off these debts by privatizing its enterprises in the interests of Russian capital. That is why there is tough bargaining under way as Minsk is trying to substantially inflate the cost of sellable assets. The growing influence of Russian capital in the country causes strong resistance of pro-Western right-wing opposition. The authorities often try to use these nationalist sentiments for preserving the political status quo. The relations with Belarus from the point of view of Russian economic interests are rather problematic. For more than two decades our country has been supplying energy to Minsk at prices significantly below world prices. At the same time Belarus also sells and resells Russian oil and its derivatives on the international market at a huge profit. To illustrate, two thirds of Belarusian exports to the EU are oil and petroleum products totaling $10.4 billion. As a result of the Belarusian economic system inefficiency, even with such huge hidden subsidies, the country has found itself deep in debt. The servicing of external debt alone in 2012 amounts to about 19 billion dollars -- 34.6% of the GDP. One important source of foreign currency was $3 billion loan of the EurAsEC Anti-Crisis Fund. On March 20, 2012 the government of Belarus sent a letter to the EurAsEC with a request to grant the third $440 million-worth tranche of this loan. Besides, Belarus may involve the emerging Common Economic Space into a confrontation with the EU: Russia’s representatives have recently sent several statements to the EU on the effect of possible strengthening of sanctions against Belarus. From a purely economic point of view Minsk seems to be more of a liability for the Eurasian integration than an asset. The main arguments of supporters of integration with Belarus are not economic but rather geopolitical, military and cultural. In contrast to Belarus oil- rich Kazakhstan is a strong economic player. Its integration with Russia has never incurred any additional economic costs – on the contrary, it has always offered great prospects. As a matter of fact, the idea of a Eurasian economic integration was first put forward by the President of Kazakhstan Nursultan Nazarbayev. However, even as far as Kazakhstan is concerned, the implementation of the agreements on the establishment of the Customs Union and Common Economic Space is not without its problems. In particular, the processes of integration with Russia have led to a sharp rise in prices reaching the Russian level and consequently to increased social tension. This in turn has spurred the growth of nationalist sentiment against integration with Russia. Accordingly, Kazakhstan, as its official representatives have stated, needs time to adapt its economic and social system to integration with Russia. In principle the failure to sign a treaty would not lead to any negative consequences. On the contrary, it would offer an opportunity to elaborate on respective documents. As is shown by the previous experience of the development of post- Soviet space, the signing of excessively comprehensive documents on economic integration (for example, within the CIS and EurAsEC) has often been no more than a declaration of intent. Therefore, caution should be taken while implementing such ambitious projects. As D.Medvedev said summing up the results of the EurAsEC Inter-state Council meeting the approach to the EurAsEC reorganization will be discussed at the next summit of presidents of member countries: “Some time later, after our authorized representatives hold consultations we will consider at the next summit the approaches to how reform these institutions”. The Kazakh Ambassador to the Republic of Belarus E. Bulegenov confirmed that his country's position is that the agreement on the establishment of the Eurasian Economic Union will be signed by January 1, 2015. Astana has repeatedly demonstrated that it honors its integration obligations; moreover, the economies of Russia and Kazakhstan can integrate easily enough. In my opinion, the uncertainty of signing the treaty by 2015 stems from the position of Belarus. Minsk is certain to use the signing of this document for obtaining further subsidies from Russia, and the continued membership of Belarus in this structure will depend on the Russian aid. The prospects of the emerging structure, where the main axis will obviously be the cooperation between Russia and Kazakhstan, were outlined in the article by V. Putin "The New Integration Project for Eurasia: the Future in the Making", published on October 4, 2011 in the newspaper "Izvestia". He pointed out, in particular, that this alliance will be one of the centers of the world economy and policy and “will ensure sustainability of global development” alongside with the EU, U.S., China and APEC. Putin also pointed out the possibility of expanding cooperation of the Eurasian Union and the EU. The two structures have a potential to complement each other. The new union can offer Europe the resources while the European Union can offer Eurasia investment capital and new technologies. Moreover, the Eurasian Union has very good prospects for the development of transcontinental transportation routes. However, there are a number of barriers to the realization of the above potential. Among them are the divisions over Belarus, geopolitical divergences between Russia and NATO, different approaches to values and ideology, associated with the problems of democratization, human rights and the rule of law, conflict in the area of energy security, in particular the confrontation over the Energy Charter etc. The solution of all these mutually complementary problems can take a long time. In the short- and medium-term, especially given the problems with Belarus, the best way for Russia and Kazakhstan is to conclude direct agreements with the EU. However, even without a rapprochement with the EU the Eurasian integration has certain economic prospects. Analysts at the Eurasian Development Bank (EDB) have assessed the macroeconomic impact of integration of Russia, Belarus and Kazakhstan in the Common Economic Space. According to their estimates, by 2030 integration might ensure the annual increase of Russia's GDP by 75 billion dollars, Belarus - 14 billion dollars and Kazakhstan - 13 billion dollars in 2010 prices. True, in this case, too, the economic impact will depend on whether all kinds of political risks not taken into account in the study done by the EDB are successfully neutralized.